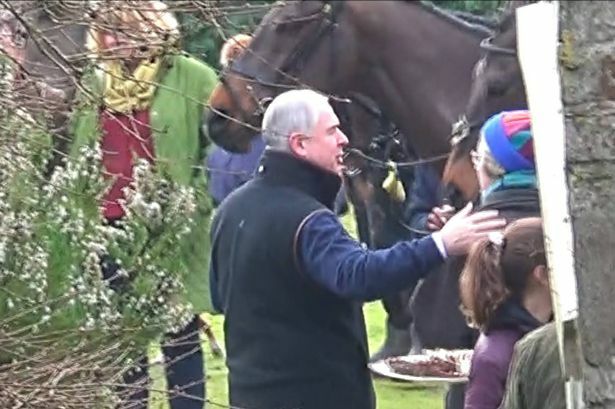 On the 5th of January 2019 our illustrious attorney general, the right honourable Geoffrey Cox QC, was apparently involved in a meeting of the Lamerton Hunt at his property at Willestew near Lamerton. The Lamerton hunt have a dubious history. Back in 2014 huntsman David Lewis, joint master George Moyse, whipper-in Steve Craddock and terrier men Wayne Bartlett, Stephen Mitchell and Gilmore Lewis were being prosecuted by the League Against Cruel Sports for hunting a wild mammal with dogs on the 26th March 2014, contrary to Section 1 of the Hunting Act 2004. But the court case collapsed due to a technicality. So the case never made it to court and the accused were never convicted. But equally, they were also never exonerated. Here’s some of the video evidence in which it is alleged that the Lamerton Hunt are engaged in illegal fox hunting on the 26th March 2014. This person was clearly telling the Devon County Hunt Saboteurs that the Lamerton Hunt, hosted on this occasion by Geoffrey Cox, our attorney general, were engaged in illegal hunting up until 3 seasons ago. This appears to indicate that, up until the 2014/2015 hunt season, their hunt support admits that the Lamerton Hunt were engaged in illegal hunting. That’s 10 years since the hunting act 2004 came into force on the 18th November 2004. 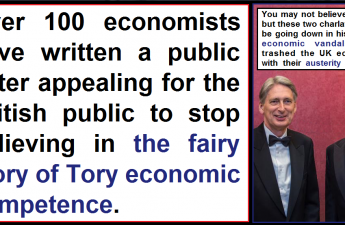 Why Does Geoffrey Cox Support Hunting? This raises the question: Why did Geoffrey Cox apparently host this Lamerton Hunt meet at his property? Polls in which the British public have been asked whether they are for or against fox hunting consistently show that more than 85% of people in the UK are totally opposed to this archaic activity. Even the Tories have been forced to change their position after Theresa May had pledged to hold a free vote to repeal the fox hunting ban. After the Tories failed to get their widely hoped-for majority the government were forced to drop their plans for a free vote on fox hunting. It was suggested by many that Theresa May’s stated support for fox hunting and a free vote to repeal the hunting act had contributed to the disastrous Tory election results. 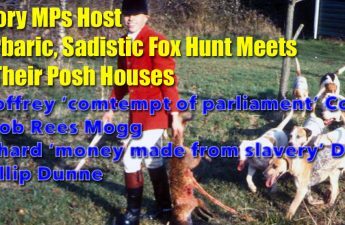 So why is Geoffrey Cox apparently supporting a hunt which has an admitted, dubious history and why does he support fox hunting when it’s a vote loser? Perhaps it has something to do with the extent to which hunting is carried out in Devon. There are a minimum of 20 fox hunts active in the county along with 2 stag hunts, 2 roe deer hunts, 4 beagle packs who hunt hares and 2 mink hunts. They are a blood-thirsty lot down in Devon. But Mr Cox should pay attention to a recent poll of rural residents in which it was concluded that ‘countryside values’ are based on a respect for nature and not killing for fun! People living in the countryside overwhelmingly rejected the idea that hunting with dogs reflects their values. A massive 91% of surveyed rural residents think that observing nature reflects countryside values, while only one in six (16%) believe hunting with dogs reflects countryside values. Local people in Devon are besieged by hunts. These countryside hooligans kill beloved wildlife, rampage and trespass across farms and gardens, kill family pets, disturb livestock, breach biosecurity, trespass on railway tracks, block roads and break many road traffic regulations. Hunt members and supporters are notoriously abusive and violent toward anyone who gets in their way or shows disapproval of their chosen hobby. They represent a beligerent minority who use physical violence, intimidation, threats and an overt disregard for the law in order to persue their perverse hobby. Time and time again police forces have failed to thoroughly investigate reported hunting crimes or other crimes committed by hunts and their supporters. Every week, during the hunting season, we see many recorded reports of road traffic offences committed by hunts and hunt supporters, going completely unchallenged by the police. Even after offences such as driving under the influence of alcohol and vehicles without registration plates, insurance or MOTs are explicitly pointed out to attending police officers – they turn a blind eye! Why? 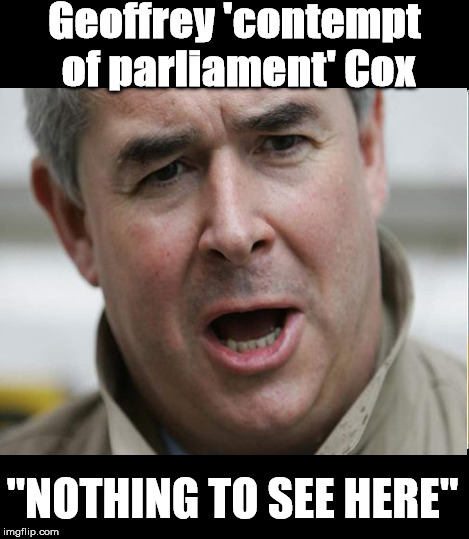 Could it have something to do with the fact that Mr Geoffrey ‘contempt of parliament’ Cox sits at the top of the legal hierarchy?